Trade Paper; $13.99; 416 pp. 1.What attracted you to the time period of the early 1800s? You may have heard this time period referred to as Regency England, and I think there is something about it that appeals to women especially. It was a time when being a true "lady" or "gentleman" was something people aspired to. A time when people were restrained by the rules of society and a high moral code. Things sometimes lacking in our world today. I also chose this time period because it is when Jane Austen published her novels, which I greatly enjoy. 2.How did you come up with the initial story idea for this book? My first novel, Lady of Milkweed Manor, featured a young woman who finds herself in an unexpected profession—working as a wet nurse.My editor encouraged me to think of another “unusual profession” for a woman to have. That led to the main character of this book, Lilly Haswell, who finds herself doing the work of an apothecary, at a time when it was illegal for women to do so. Apothecaries prescribed, prepared, and dispensed herbal remedies or “physic.” Prior to the twentieth century, an apothecary was much more than a pharmacist (or what the Brits call a chemist). An apothecary also served as a general practitioner, acting as physician and sometimes even surgeon or midwife. There were relatively few licensed physicians at the time and most people could not afford their fees. The Apothecaries’ Society still exists in the UK, and is actively involved in licensing doctors and providing continuing education. 4.What sort of research did you do to write this novel? I read stacks of books and also had the opportunity to travel to London, where I dragged my husband to the Worshipful Society of Apothecaries and the Museum of the Royal Pharmaceutical Society of Great Britain. Hopefully, I’ve managed to include only enough historical detail to give the “flavor” of a time period while keeping the characters and story focal. How much detail do today’s readers want about leeches and blood-letting? Not a lot, I’m guessing! 5.What is the underlying theme of the book? 6. Even though this is historical fiction, is there a message you would like today’s readers to take away from the book? Yes, I think the book’s message is relevant today:While many of us search for elusive happiness “out there somewhere,” the most important things in life (family, friends, faith, and health) are often right before us and ought not be neglected. 7.What stands out about your characters? Do any of them have unusual traits. Lilly’s brother is “slow of mind” from a prolonged birth (what we today might call birth asphyxia). And Lilly’s friend, Mary, suffers from epilepsy, then called “falling sickness.” Lilly herself has a nearly infallible memory—a trait I only wish I had! 8. Does the book tie in to any real historical event? The plot reflects the historical strife between physicians and apothecaries (physicians believed only they should be allowed to treat and prescribe) as well the Apothecaries’ Act of 1815, which, among other things, made it illegal for an apothecary to refuse to fill a physician’s order—even if the apothecary knew the medicine might prove fatal. 8. One of the things I want to know about is the remedies you came up with for the illnesses. When you were in Europe, did you ask for each specific item that was put into the medicines described? Did you have to research illnesses that were common in that time? What about the laws of practicing? Was that hard to figure out for the time period? The research was fascinating but tricky, too. Many of the same illnesses and remedies existed then as today, but under different names. All of the remedies mentioned in the novel were actual remedies or "physic" I found described in old books. (Yes, they really used "macerated millipedes" for example). When we were in England, my husband and I visited both the Apothecaries' Society and the Pharmaceutical Society of Great Britain and there learned about the laws and tensions between apothecaries and physicians and saw examples of the odd devices and medicines used throughout the centuries, as well as demonstrations in pill and tablet making. 9. Was it hard to figure out which man she was going to end up with or did you know from the beginning who the right man was for her? I was totally all over the place trying to figure out who I'd choose. The dark sinister man who's not aware of the woman before him finally coming to his senses? The doctor who's all business finally lets his heart spring a leak, and then the apprentice...it was hard for me to wrap my mind around him because he was so unassuming at first and seemed so much younger. In a way, their part of the story reminded me of "The Princess Bride." I've been delighted by the emails I've received from readers who, like you, couldn't guess which man Lilly would choose-and enjoyed the suspense of not knowing. When I started writing, I did not know which man Lilly would end up with and actually was torn between a few of her suitors. When I realized which man it would be, it was a challenge write in such a way to keep readers guessing but also to develop and grow the characters so that by the end, at least most readers would think, "Yes, he is the best man for her." 10. And lastly, when is your next book coming out? Can you tell us anything about it? As Olivia and Lord Bradley's hidden pasts catch up with them, will the truth dash their hope of love...or pave the way? This was such a great book. I wrote to Julie after I got it to let her know I pretty much went without sleep when I started reading. We meet Lilly, who has lived in a small village all her life. Her mother left when she was young leaving her father to take care of Lilly and her disabled brother. As an apothecary, he takes on an apprentice, who doesn't seem to get it. Lilly on the other hand memorizes prescriptions with ease. Lilly is given the opportunity to go to London and learn about high society sponsored by her aunt and uncle. There she meets Dr. Graves. Will he see how capable a woman she is? There are a couple of other men in the novel that make the reader wonder if Lilly will end up with anyone. I loved Lilly's transformation during the story. I think we can all relate to some degree about wanting to get away from a place we've lived all our lives, or maybe just too long. She finds her place, and I love where she chooses! Alrighty Klassen fans, specifically bloggers, here's what we're going to do. We're going to circulate this ONE book though 10 bloggers. Each of us will read and review Julie's book and then pass this book on to the next blogger winner of your choosing. 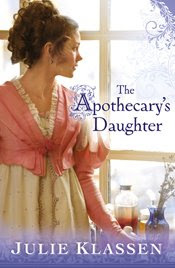 The last person to read/review The Apothecary's Daughter sends it back to Julie. That person can contact me to get Julie's mailing info. So, if you're game, leave a comment, the name of your blog, and your blog address. Oh, don't forget the all important email address. :) U.S. residents only please. I will draw a name on May 5. Thanks in advance for your commitment. hey! cool. I am jumping on this. I'd love to win The Apothecary's Daughter. I don't buy too many books, but I bought the Lady of Milkweed Manor. Wonderful story, great plot idea and characters. Oh, and such a pretty cover! Great to know another one is coming along too. Thanks for this interesting interview and opportunity. I loved this book. I read it a few months ago and it has remained one of my favorite books. I would love to win a copy to give to my church library. Hi Mimi, here is my blog address www carlybirdshome dot blogspot dot com. Thank you for the Facebook add. Nice blog, Mimi! I enjoyed browsing through it. Thanks for the nice article about The Apothecary's Daughter!